This movie was just... bizarre. I really don't know any other way to explain it. Of course, musicals are always a little kooky because people just randomly break into song, then continue with dialogue after their number ends as though nothing happened. But this movie in particular was... odd. I'm not quite sure I can put my finger on it, but I couldn't help thinking this was like a low-grade Baz Luhrmann rip-off. Like, if you factor out all the famous people in the movie, this could have been an excellent high school production. The casting was ok, although I could probably do without ever seeing Alec Baldwin sing again. It made me equally as uncomfortable as when I saw James Bond singing ballads in Mamma Mia! And Tom Cruise playing a whacked-out weirdo? Not exactly a stretch. I felt like I was just looking into his life on a day without his handlers. A. He's unattractive. I'm not saying that for just my taste - I'm pretty sure it's just a fact. And if you don't believe that, you have to at least agree he is not nearly as cute as Julianne Hough. In what world does he get her? B. 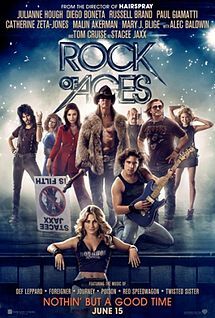 This movie is a nostalgia trip for anyone who grew up listening to 80's rock bands. So what would a kid who was born in 1990 be doing in it? Were the producers trying to attract a younger crowd? Because somehow I don't see a bunch of 16 year-old girls running to see this movie. I think the movie was supposed to be a satire, but I'm confused as to what it was mocking - the 80's in general, perhaps? If it wasn't supposed to be a caricature of the times, well, then, it was just weird. Don't get me wrong - the music was amazing. But it got to the point where I'd look forward to what song was coming next and then feel disappointment sink in when it was over, knowing the "real acting" was coming back. Maybe I should have just bought the soundtrack. Final word: This movie reminds me of a classic line from the movie Strange Brew: "This movie is rated 3B - three beers and it's good." Post script: Throughout the movie, I kept having flashbacks to Burlesque. That should tell you something.